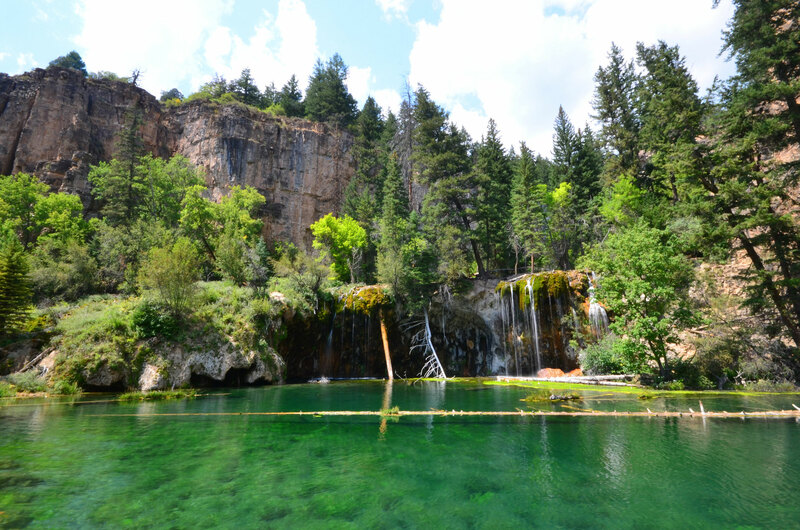 Hanging Lake is one of Colorado’s otherworldly gems. Its wispy waterfall tendrils, gumdrop-green waters, cliffside location (hence the name) and lush surroundings make it one of the state’s most popular hikes and are why it was named a National Natural Landmark in 2011. 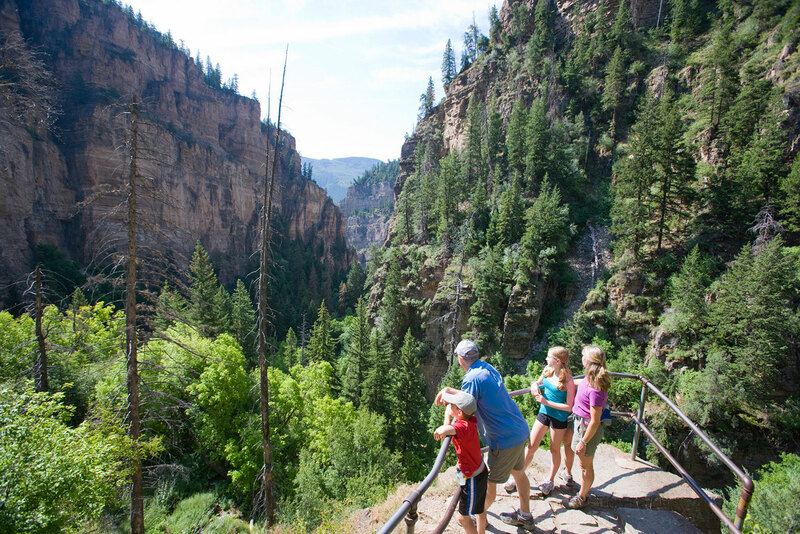 Branching off I-70 just 10 miles east of Glenwood Springs in the spectacular Colorado River-carved Glenwood Canyon, the Hanging Lake Trail is a must-stop along this scenic patch of highway. The trail is relatively short — just over a mile — but it’s quite steep and rocky. There are, however, plenty of places to rest along the way, take epic photos of the canyon and the river flowing through it, and explore rocky hideways. And handrails on especially tricky parts of the trail help keep you moving in the right direction. Making it to the top will take your breath away! A walkway surrounds the lake, from which you can gaze into its hypnotic waters and spy the native trout frittering within. 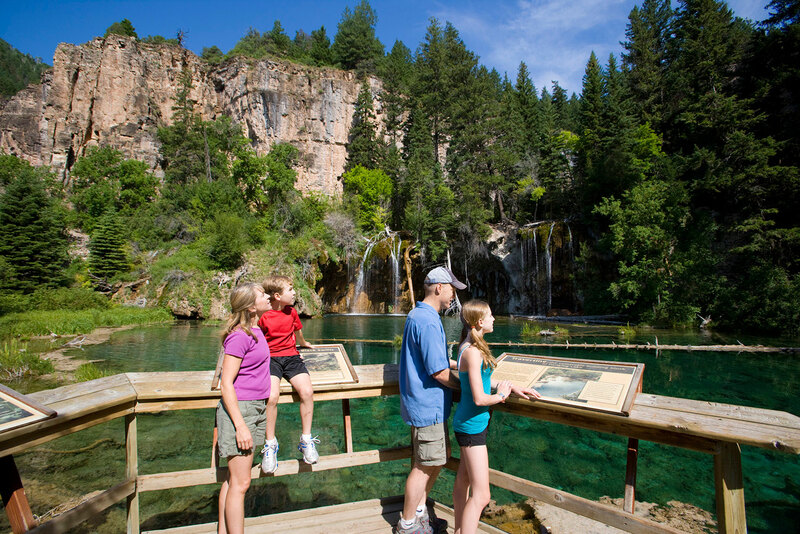 A Hanging Lake permit and shuttle system is in place to protect the fragile ecosystem and provide visitors with high-quality experiences through education and interpretation at the Hanging Lake Welcome Center and along the trail. Permits will be required year-round, visitors can reserve a permit at VisitGlenwood.com. During the peak season, from May 1st through October 31st, no parking is allowed in the Hanging Lake Rest Area off I-70. Visitors can park at the Hanging Lake Welcome Center at 110 Wulfsohn Road, Glenwood Springs CO 81601 and board the Hanging Lake Shuttle. During the off-peak-season visitors will be able to park at the Hanging Lake trailhead. Forest Service Rangers will check permits throughout the year. To arrive by car, if driving eastbound I-70 (toward Denver), you can take the Hanging Lake exit. If you’re headed westbound (toward Glenwood Springs and Grand Junction), things are a bit trickier: You’ll use the Grizzly Creek exit, cross the highway and get back on I-70 headed eastbound. Then, you’ll take the Hanging Lake exit. Visitors who would rather bike or hike to the Hanging Lake trailhead can do so and enjoy the riverside Glenwood Canyon Recreation Path from the town of Glenwood Springs (9.5 miles). However, a permit will still be required year-round no matter how you get to the trailhead. Be sure you’ve got good hiking/walking shoes, sunscreen, a hat, a camera and plenty of water to drink along the way. Your dog (they are forbidden from the trail and the lake), fishing gear or swim wear. Though it looks quite inviting, there’s no swimming or fishing in the lake. Additionally, touching or drinking Hanging Lake's water is strictly prohibited as well as standing under, behind or on top of the waterfalls and walking on the fallen trees within the lake. Part of the reason the lake and the area around it remain so majestic generation after generation is that people are asked to stay in designated areas. The lake’s ecosystem is quite fragile, and we want people to be able to enjoy it for years to come. The Hanging Lake permit and shuttle system is in place to protect the fragile ecosystem. Find out how to apply for a permit and the shuttle that begins May 1, 2019. You can also purchase a permit to bike to the trailhead. Learn about other National Natural Landmarks in Colorado: Garden of the Gods, Roxborough State Park, Spanish Peaks and more. And find other popular Colorado hikes and read about Colorado hidden gems like Island Lake near Silverton. Photos: Flickr/Sayamindu Dasgupta (the first one); courtesy of Glenwood Springs Chamber Resort Association (all the rest).